ISH French residents, Agathe Riquier, Florence Declaveillère and Hadrian De Blander were invited to celebrate the French National Day at the French Embassy and had an opportunity to meet Ambassador François Delattre. Agathe is currently conducting research at the Smithsonian Institution’s Museum Conservation Institute as part of her Master’s Degree studies at the Université Panthéon – Sorbonne; Florence is serving as an intern with the National Trust for Historic Preservation; and Hadrian is participating in an internship in the field of oncology at the National Institutes of Health. Commonly called the quatorze juillet, French citizens commemorate the beginning of the French Revolution with the Storming of the Bastille on July 14, 1789. Agathe noted “The opportunity to celebrate Bastille Day in the nation that has certainly influenced the French Revolution was a valuable experience.” The event featured traditional French food and drinks with a live band performing popular French songs. The residents were honored to meet the Ambassador. Ambassador Delattre served as the Diplomatic Chair of ISH’s 2012 Global Leadership Awards, and has spoken at the House several times. He will soon depart Washington to become France’s Ambassador to the United Nations. 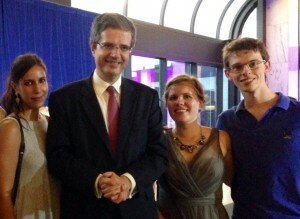 ISHDC sends its congratulations and warm wishes to Ambassador Delattre in his new and important duties. We remain grateful for his strong support of ISH over the past several years and look forward to continuing our warm relationship with his successor, who has not yet been appointed.